Make sure that you never miss another appointment by taking advantage of AgentPro software’s useful text reminders. The reminders can be used both for clients and your negotiators, making sure you never miss an appointment. You know how important it is to create a good impression to your vendors and clients, and being punctual and organised is essential for this. The reminders are extremely easy to set up using your diary and you can even pick your own reminder times – whether it’s an hour or even a month before the appointment. 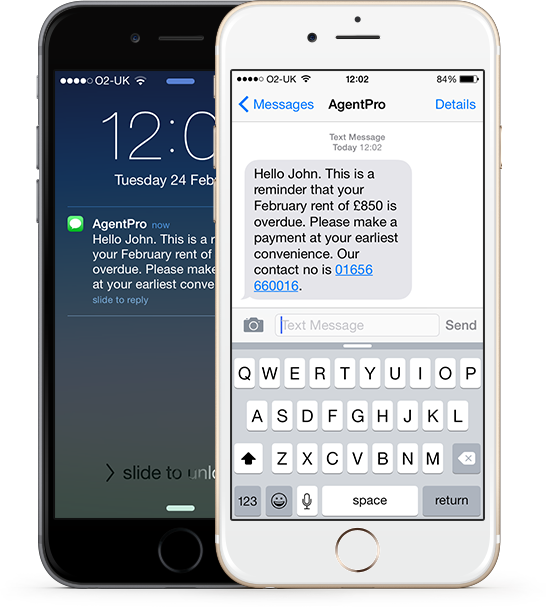 Through AgentPro’s client matching function, you can send out text messages to your clients letting them know about new property they might be interested in. This technique of targeted marketing can significantly improve your sales because you are offering you offering your clients something they’re likely to want. Plus, you can make sure that the messages you send out are branded so your agency’s name is the very first thing that pops up on the screen of your clients’ phone. This is a useful personalisation tool your client will not regard the text as spam since it’s not from a random number. You can even customise every single message you send out to make them as personalised as you like. Since direct marketing involves marketing your products or services to your client directly, you should make your messages appear to be for that client and that client alone. However, if you have a special offer you’re looking to run or just want to wish your clients a “Merry Christmas”, then you have the ability to send out bulk texts to large numbers of clients. You can also text tenants to remind them about overdue rent – it’s an easy and non-threatening way to remind tenants who have forgotten – and it lets them know you’ve noticed. SMS saves you the time of having to constantly ring clients and clutter their phone with voicemails that never get picked up. Customers are much more likely to respond to a text message – and therefore convert - as it is such a direct and personal medium. Because we use a third party provider, texts are changed at 7p each. If you’d like to limit the number of texts sent, we can set a monthly limit. If you do send a lot of texts, you can purchase an SMS bundle, which brings the cost down. These bundles have no expiry date, so they can be used as quickly, or as slowly as you’d like. To find out more about SMS marketing for estate agents contact a member of our team on 08456 444 446 or email info@agentpro.co.uk.